The long-anticipated 3rd edition of RockTape’s PowerTaping Manual has finally been released, and it was definitely worth the wait. Subtitled, “Theories and Practical Applications of Fascial Movement Taping,” the manual again extends the boundaries of kinesiology taping for both rehabilitation and performance enhancement. As with previous versions, the book is separated into sections for rehab and sports performance. Step by step instructions are provided for taping a wide variety of injuries, health conditions and sports movement chains. 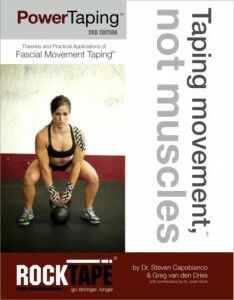 Fascial movement taping (FMT) is based on the premise that everything is connected. The function and condition of any muscle is also affected by the fascia surrounding the muscle, its connective tissues, its innervation and the other muscles involved in its movement. The most effective therapy and sports enhancement techniques no longer focus on a single muscle, but instead focus on the entire “movement chain” of muscles and their related tissues. In addition to in-depth information on taping theory and techniques, PowerTaping includes a detailed section on performing functional assessments, also known as movement screening. This differentiates FMT from all other taping approaches in that it provides both an assessment matrix and a treatment methodology. This allows the clinician to learn how to identify and quantify dysfunctional movement patterns as well as how to tape to help correct these dysfunctional patterns. The balance of the book provides detailed theory and technique on PowerTaping for Rehabilitation and PowerTaping for Athletic Performance. Rehabilitation topics include lower and upper extremity taping, taping for neurological issues, postural correction, edema control taping and taping for pregnancy-related issues. The athletic performance section is divided into sections for each of the major performance muscle chains. Written for athletic trainers, therapists and clinicians, Fascial Movement Taping includes a significant amount of medical terminology. The taping instructions and accompanying photographs, however, are easily understood by anyone with a general knowledge of the body. The third edition of PowerTaping – is a reference that will be frequently turned to by anyone actively involved in kinesiology taping.